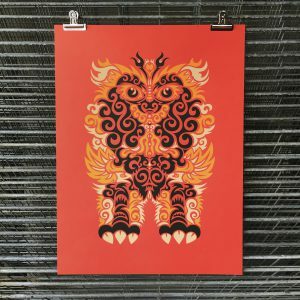 This limited edition serigraph is hand printed on heavy cover stock by French Paper Company. The print is a part of the TOTEMS series illustrated by Brad Ruder. This limited edition serigraph is hand printed on Cougar cover stock by Domtar. The print is a part of the TOTEMS series illustrated by Brad Ruder. 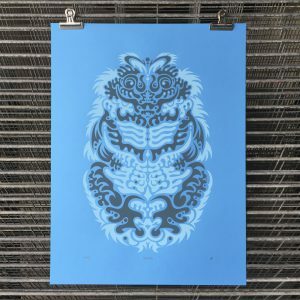 This limited edition serigraph is hand printed on brilliant blue cover stock, using glow-in-the-dark ink. The print is a part of the TOTEMS series illustrated by Brad Ruder. 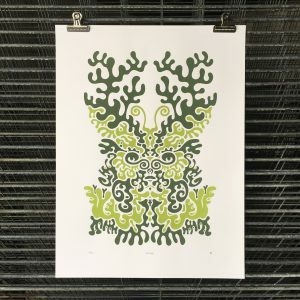 Located six stories up in downtown Wichita, Kansas – Tilt Union is a screen printing studio focused on producing quality prints and other printmaking projects. Get your hands in some ink with a printing class or grab up some handmade goods from our store. The studio is a passion project and personal creative space for owner Brad Ruder, who is in charge of mixing ink and cleaning screens, mostly. Get timely info on events and special offers from the studio. We promise not to bug you all the time. © Tilt Union 2019	| Theme design by Deuce Themes.